The Enterprise is a unique undertaking. On the one hand, it is an organ of the Sea-Bed Authority and is to act in accordance with the general policy of the Assembly and the directives of the Council. On the other hand, it is to enjoy autonomy in the conduct of its operations, operate in accordance with sound commercial principles, and make its decisions on the basis of commercial considerations only. 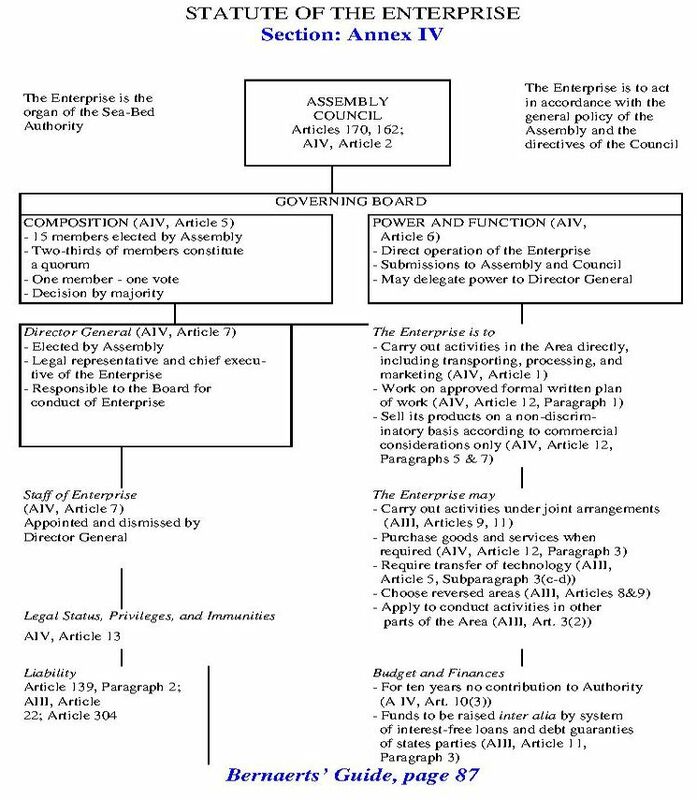 As an organ of the Authority, it has legal personality and such legal capacity as is necessary to achieve the aims expected from it, such as providing funds for the Authority, providing technology and training for personnel from developing countries, and, last but not least, supporting the mineral policy of the Authority. For this purpose, the Enterprise is entitled to act as any other operator in carrying out activities in the Area, including transporting, processing, and marketing of minerals, after obtaining approval of a plan of work and a production authorization. But the Convention also permits joint ventures of the Enterprise, either with developing or developed countries. The Enterprise is to have title to all minerals and processed substances produced by it. The Enterprise is expected to become self-supporting. As it can be assumed that this will take considerable time, the Enterprise is exempt from payment of contributions to the Authority for ten years. In addition, funds are to be raised by various means so that it can commence operations as soon as possible. As it is unlikely that the necessary funds will be raised by voluntary contributions from states parties or from the financial resources of the Authority, states parties are obliged to lend money to the Enterprise on a long-term interest-free basis for half of the funds and to guarantee debts incurred by the Enterprise in raising the other half; each state party's share is to be calculated in accordance with the scale of assessments for the United Nations regular budget. Further measures can be taken if the necessary funds are not raised in this way. In order to assure an early and effective entry into operation of the Enterprise, the Preparatory Commission is to establish a subcommission to deal with any questions which may arise. The amount of the funds for initial operation mentioned above and the criteria and factors for the adjustment of the same are to be included by the Preparatory Commission in the draft rules, regulations, and procedure of the Authority. The Enterprise is to have its principal office at the seat of the Authority. The Enterprise may establish offices and facilities in other states. One of the main tasks of the Enterprise is to act as a "medium" to ensure the effective participation of developing states. For this purpose, it may apply for approval of a plan of work in any part of the Area or in reserved areas, and if it does not intend to carry out activities in a reserved area (either alone or together with states), developing states may apply to conduct activities in that reserved area. Applications for production authorizations in a reserved area can be of advantage to the Enterprise (developing state) in comparison with applications for other parts of the Area, as the former enjoy priority if fewer reserved areas than non-reserved areas (being worked by operators with exclusive rights) are under exploitation. Furthermore, the Enterprise is the arm of the Authority for the acquisition and transfer of technology as well as the training of personnel of developing countries.